Rainbow Riches Bingo is a fast game that is ideal from mobile or tablet play. It is a 40 ball variant which is found on the best slot machines. You can play the game from 9am through to midnight across the Virtue fusion network although not all of them are participants. The cards have 8 numbers arranged as two 4-leaf clovers. The prizes are given for 1 clover and for the full house. There are two rainbow clovers in addition to the 40 numbered balls which may or may not appear during the course of the game. The leprechaun moves a space along the track for each rainbow clover called at the end of the game. The track is in rainbow form and originally had a pot of bronze on space 20, a pot of gold on space 100, a pot of silver on space 40 although it was tweaked to put them on 10, 50 and 25. These are the 3 progressive jackpots and all of them are community jackpots. The prize is split between all the players as per the number of tickets purchased for the game leading to a decrease in the jackpot. If the Leprechaun doesn’t land on a pot but instead takes two steps and overshoots, 50% is paid out and the remaining divided between three pots for the consequent games. The game goes haywire if the Leprechaun is a step or two from the goal and everyone goes for maximum tickets so as to get a fair share of the pot. 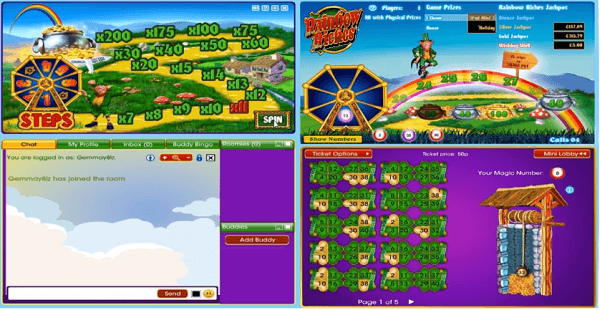 The Rainbow Riches Bingo has the Wishing well Bonus and to play, you need to buy a minimum of 5 tickets. At the beginning of the game one picks a Magic Number. This one enables you to have the same automatically set for each game played. If the magic number is called, the coin is placed into your personal wishing well. The Rainbow Riches free play at Mecca Bingo is part of the Rank group Plc, an entertainment group has over 40 years experience in the betting industry. Bingo players value the Mecca bingo brand like no other. It is now available on the online casinos. The Mecca offers different promotions that other companies do not do. The jackpots and promotions still remain unbeaten and the online bingo game still maintains its tradition of attractive jackpots. New players may not be aware of the lucrative bingo online. This is among the easiest games to play. It is very easy to play since your numbers are marked automatically hence no chance of missing one enabling you to relax. The game is also very fast and you can play every two to three minutes, no delays. 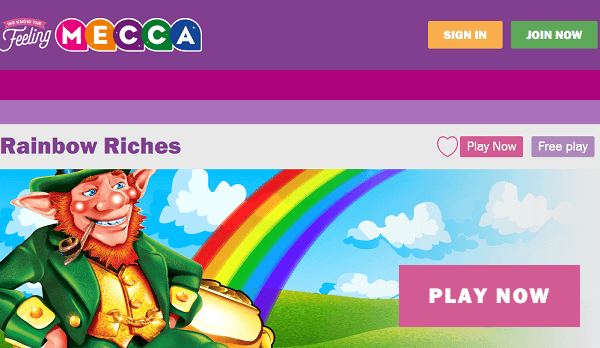 The Rainbow Riches at Mecca Bingo is also a new feature, that is very lucrative in the Mecca Bingo. The game is fun but beginners may need to gain experience and familiarity before going to real money games. You do not need any registration to play this version of the game. All you need to do is identify the website that you prefer and locate rainbow riches mecca bingo. Select the game and choose the free play option and you will be ready to play. The thrill of bingo on mobile is just amazing. It has a fully featured application both for mobile and PC. There are impressive varieties of slots that you can play in and these are compatible for Android, iOS and iPhone. This and other bonuses like the top cash match makes it even more tempting and you can double your chances of winning through this feature. This can be utilized for both bingo or slots or a mixture and this is part of the joys of Mecca. The rainbow riches free play mecca bingo does not give you a full treat of the winnings but it displays the gains behind it. The Rainbow Riches at Gala Bingo is another version that offers spectacular bonuses. It begins by welcoming you with a very generous bonus when you sign up. In addition, new players are given up to 7 days of free bingo with high chances of winning. The promotions not only favor the new players, older players also enjoy various promotions and rewards, therefore, winning are a must for gala bingo players. There are various exciting games and the Rainbow Riches at Gala Bingo is a very amazing one. There is a Newbie room which is opened for certain time periods and this is the chance for the new players to gain some experience and familiarity. There is no deposit required to play the free version of the game. This feature gives the feel of the game without parting with your cash and prepares you adequately for real money version. Gala is simply one of the most reputable companies in bingo. The availability of the various slots totally increases its popularity a million folds. The Rainbow Riches at Gala Bingo is undoubtedly one of the most appreciated versions of the game. It has made the game very easy and convenient to play accepting deposits from a wide variety of money institutions. The operator of the game which is Gala Interactive Limited that was born from Gala Coral Group Limited is doing justice to the betting industry. It has valid licenses from the relevant authorities in its jurisdiction and uses the most sophisticated technology to provide high quality game. Gala Bingo is powered by the powerful Virtue Fusion software which is a subsidiary of Playtech. The online version has contributed greatly to the successes of the Rainbow Riches at Gala Bingo. The Gala bingo games are many and you will always find your favorite in the site. 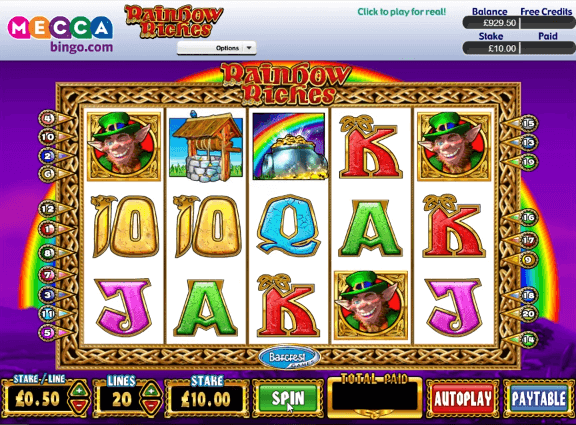 Rainbow Riches are one of the most popular games in the betting world. If you have not played the game then you simply have not been officially initiated to the practice. With the amazing features and graphics, you can get an amazing gambling experience that you will certainly not forget.